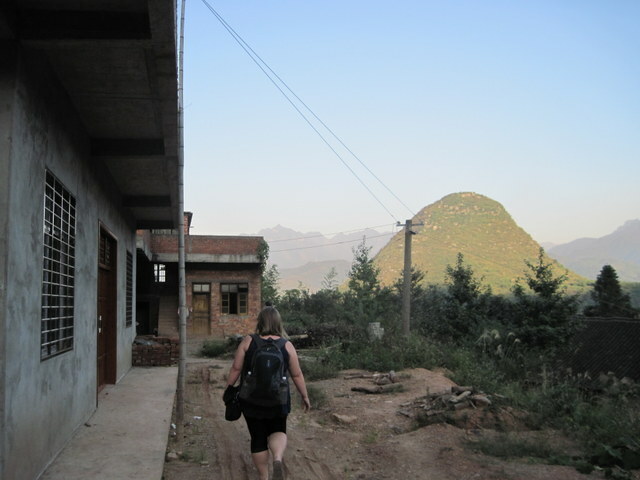 Twelve Hours on a Farm | china-land. We ascended the bus and I was awestruck. Faces stared in bewilderment both ours and theirs/sized each other up/sized each other down. At first sitting, a little girl chanted, ‘wai guo, wai guo, wai guo,’ at me, meaning: ‘foreign, foreign, foreign.’ I snapped back ‘Chinese, Chinese, Chinese,’ in Chinese and everyone giggled. This bus was taking us to a village called, ‘Jiao, Jiao.’ Our host, Daniel, told us it would take two hours from the major city, Guilin. We spent 3.5 hours on this bus. This bus took us into rural-er than rural China, yet they showed, ‘Hotel Rwanda.’ We had traffic, dust, bumps, small villages, big villages, reservoirs, highways/small highways, and crowded one way roads. Our stop was last, it was priceless seeing families greet loved ones returning home from big cities. Something must be said for the tumultuous traveling Chinese people put up with just to go home for holidays. 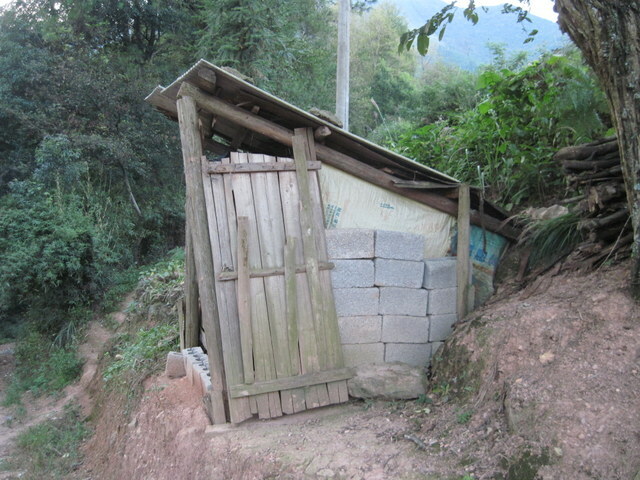 I have a new found respect for Chinese people. So we hopped on a ‘tricycle,’ as Daniel liked to call a motorcycle with an attached trailer to ride in. Off we went for another fifteen minutes through farm roads and lands. At last we arrived where we could no longer take the tricycle. We jumped off and proceeded to walk another five minutes up gravel and dirt to Daniel’s farm house on the hill. Our first greeting was a little ‘shed.’ Christy told us, ‘that’s the bathroom.’ I honestly didn’t believe her at first and laughed hysterically. I was more than mistaken. Underneath the slats was some type of tub that Daniel’s mother emptied out every so often. I tried my best not to use it. I didn’t notice until later that there were worms and other critters doing a jig inside. 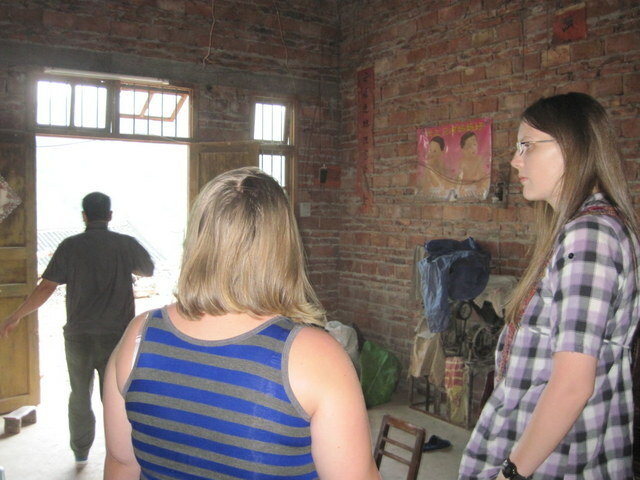 So we received a tour, here was the living room. We called this the 1950’s room. It had satellite television and a wooden sofa to sit on, a little table for our dinner and a mantle. Sarah and I received our own room to share. We think it was Daniel’s niece’s room because she kept coming in to visit us and help us with anything we needed. It was brick walled and a concrete floor– surprisingly warm in the 55 below evening. 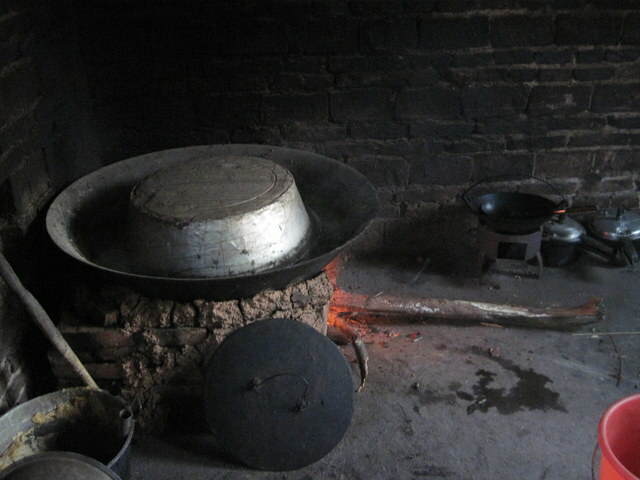 The kitchen was a brick oven. According to Christy, Daniel’s parents were cooking dog food in it at the time this photo was taken. 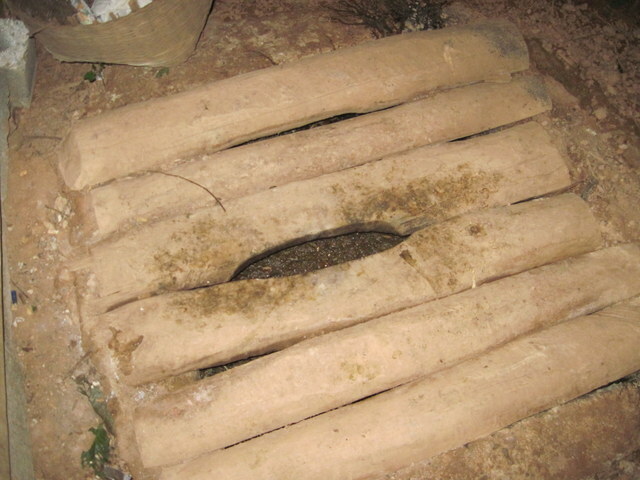 Dog food was gathered from the sweet potatoes’ roots. 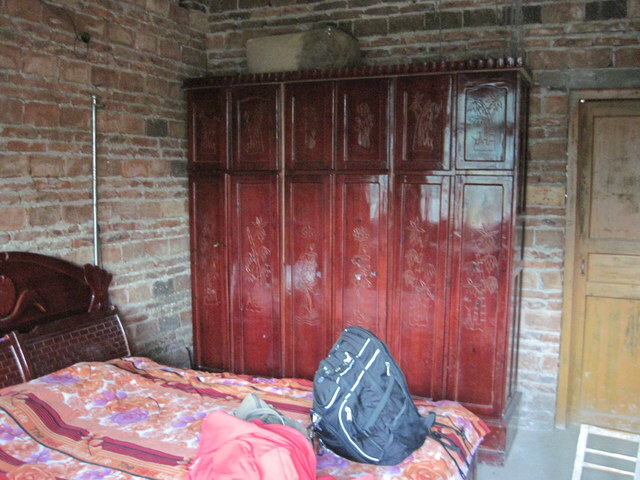 We called the kitchen, the room from 1600’s. Here was our kitchen sink, shower, and communal sink. We brushed our teeth, washed our hands& washed off atop this little platform. 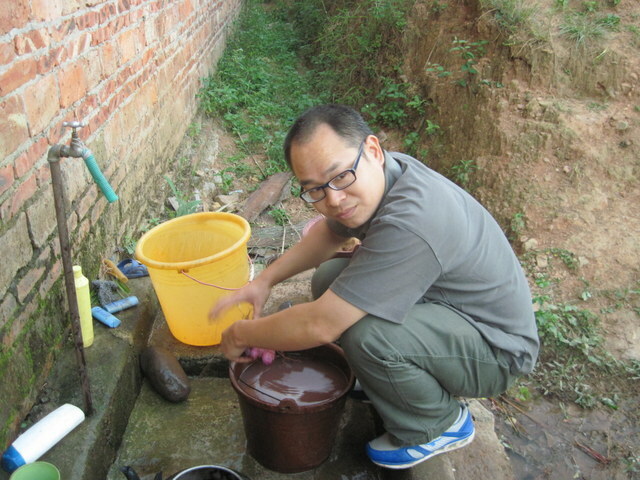 Here Daniel is cleaning our sweet potatoes and water chestnuts. 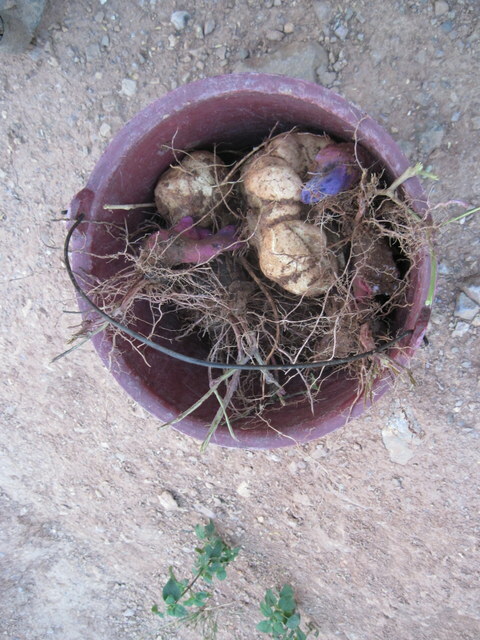 Daniel picked some fresh water chestnuts for us. I had never peeled a chestnut and eaten it before. It was delicious. 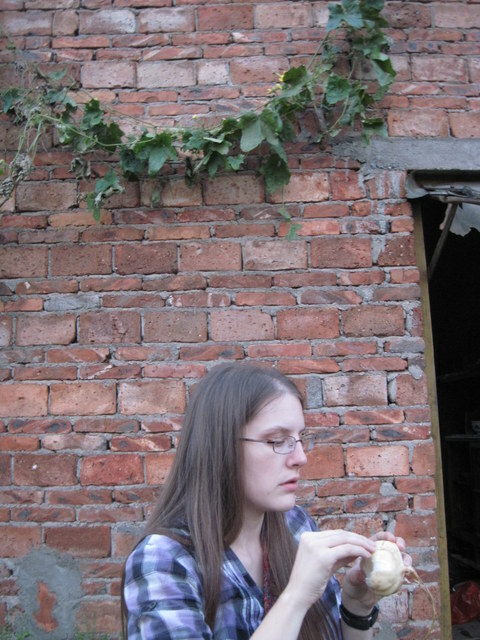 Here is Sarah enjoying hers. When we arrived, Daniel’s father was nowhere to be found. We asked Daniel where he was. He said, ‘My father’s hunting wasps.’ An hour or so later the father emerged with two sacks full of wasp nests for dinner. We asked Daniel how does one, ‘hunt wasps.’ Daniel told us…’just put on a raincoat, boots, gloves,’ and have at it! 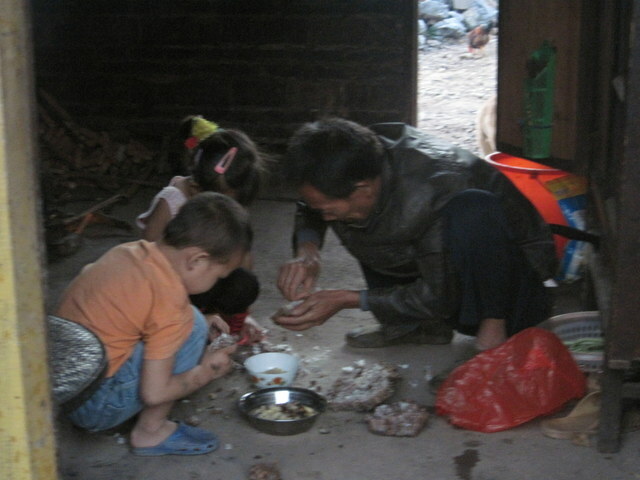 Here are Daniel’s niece and nephew sifting through the wasps with their Grandpa. Picking off stingers, picking out larvae to be fried up for dinner. Dinner was fresh cucumbers in sesame oil-garlic-vinegar, a duck from the farm, wasps, and sweet potatoes. In addition to, the most delicious rice I have ever had in my life. The rice tasted like a soft petal glistening against cloudy fluffs and pillow mounds. I have never tasted more fragrant/delicious rice. I had three bowls. I tasted the duck which was cooked perfectly and tasted every bit fresh as everything else. Then came the wasps. I ate two full wasps and two larvae. As long as I could trick my mind I was able to eat these morsels. Apparently wasps are a very expensive dish and they are very good to your health–full of protein. The cucumbers were incredibly sweet while the sweet potatoes melted in your mouth. Everything was so fresh. However, in the middle of the meal when I was told everything from the toilet is used as fertilizer…I choked a bit on a stinger. The Mid-Autumn Festival celebrates the equinox’s full moon. We eat ‘moon cake’ in the evening or ideally at midnight and pray to the lady in the moon. Daniel’s home had a rooftop and we climbed atop and enjoyed the full moon, mountains, radiant stars, and crispy air. I wanted to howl at the moon something awful. We ate our moon cake with the children fairly early because we were all so exhausted. Sarah and I melted into our bed and didn’t wake until the roosters crowed–right outside our window. Never have I woken to an animal alarm clock. 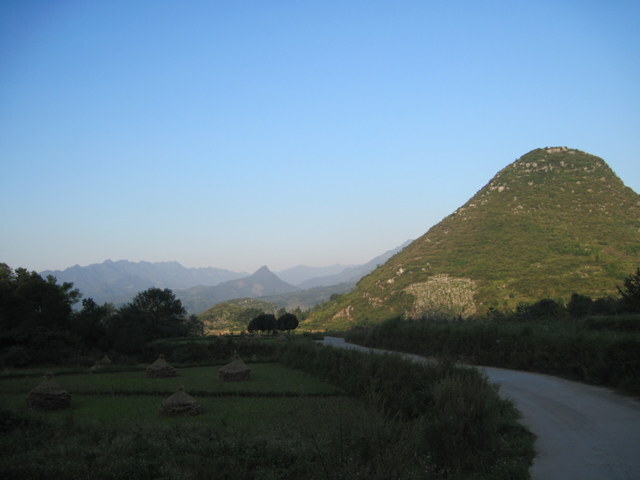 We ate breakfast, watched the sun rise over the mountain and took off in the tricycle –leaving our splendid rural farm to either a memory or a dream? This entry was posted in Uncategorized and tagged animals, Chinese culture, Chinese National Day, Chinese transportation, farm, mid-autumn festival, toilets, village. Bookmark the permalink.